4,228 grt; 6,900 dwt; part-reefer; 12 passengers. Operator: Horn Linie, Hamburg, Germany. Flag: West German. Built: 1957 by Deutsche Werft AG, Hamburg-Finkenwerder, Germany. Yard no: 724. Main engine: seven-cylinder, two-stroke MAN K7Z70/120A of 5,850 bhp at 125 rpm. Speed: 16.5 knots. 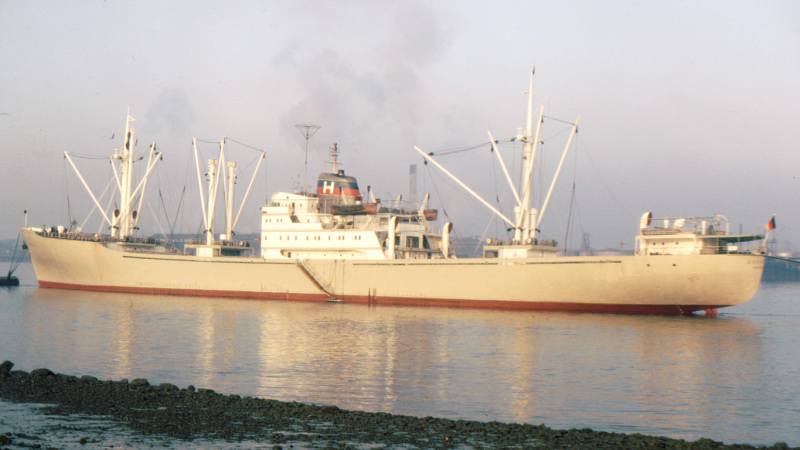 1975-sold to Yick Fung Shipping Enterprises Co Ltd, Hong Kong (a company controlled the People’s Republic of China) renamed LI SHAN; 1990-to breakers at Alang, India 23/5. Photo: moored in Long Reach, Thames at Dartford. That's what we can call a ship !